Every generation in all human cultures struggles with issues of authority and resistance. The struggle often feels new and urgent—rightly so!—but there is much we can learn from the experiences and reflections of other in different times and places, whether this be in the form of poetry, fiction, history, or philosophy. I come to Arts One from a background in cultural anthropology, much of which has been focused on documenting the history and changing experiences of the Maisin people of Papua New Guinea, famed for their beautiful bark cloth. The Maisin live in what anthropologists often describe as an “egalitarian society” where people place a strong moral stress on building consensus. What I’ve learned through more than three decades of working with my Maisin friends as they have fought to prevent loggers from clear cutting the majestic rain forests from which they get food and materials is that both agreeing on proper authority and resisting powerful forces are universal themes. We have so much to learn from each other. These are themes I explore in many of my publications, the most recent of which is Ancestral Lines: The Maisin of Papua New Guinea and the Fate of the Rainforest. My connection to UBC goes back to 1987 when I arrived as a PhD student. 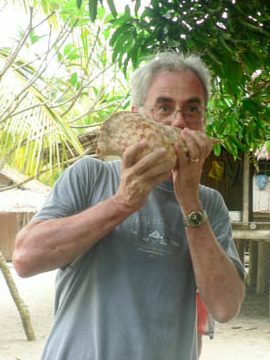 Since 1987, I have taught in the Department of Anthropology on a variety of subjects, especially on the cultures of Pacific Island people and on religion. I’m thrilled to be joining Arts One for the opportunity to read and intimately discuss some of the greatest literature published on the theme of authority and resistance. I plan to bring a distinctly anthropological perspective to the mix, particularly Fadiman’s The Spirit Strikes and You Fall Down, a moving account of the experience of Hmong immigrants adjusting to living in North America and Mintz’s Sweetness and Power, a brilliant history of sugar and its connections to systems of power, most notably slavery. My other contributions include Fanon’s classic account of the experience of colonialism, The Wretched of the Earth, and Atwood’s The Handmaid’s Tale (which seems all too prescient at this moment of history! ).